A few tips for picking the best WordPress theme for your website. There are tons of WordPress themes available for any type of site you could want to build. One of the things that allows WordPress to continue to gain more and more of the web marketplace is the great resources available through the community. But wading through all the options to pick a good theme can be difficult. There are a lot of WordPress themes that promise to “do it all”. But I’ve found these themes to suffer from performance issues. Not to mention the learning curve involved with getting the theme up and running in anywhere close to the demo site. Before you start your theme shopping you should put together a list of the specific goals you want to accomplish with your WordPress site. And from there break that down into specific features. Let’s say our goal is to increase online sales for our WooCommerce store. 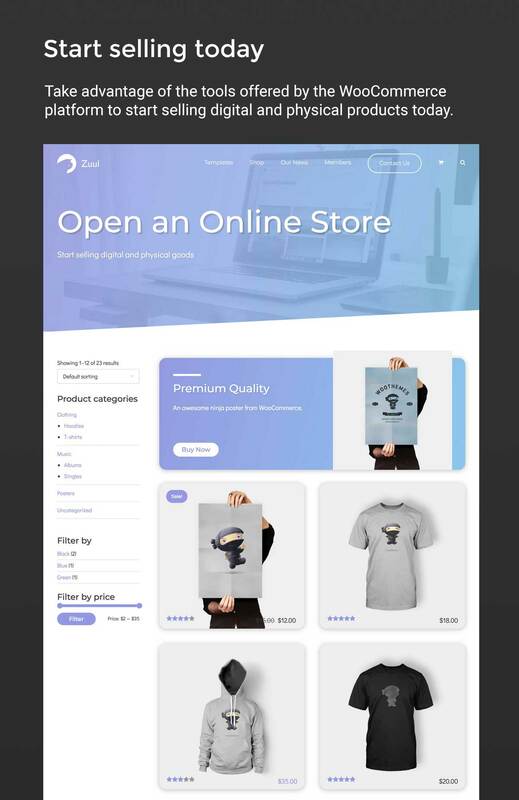 You will want a theme that features WooCommerce support. Maybe you want to focus on content creation and don’t need sidebars distracting your user’s from your content. You’ll want to look for theme’s that provide a clean reading experience to the user. Now I’ve cherry picked a few options from our Zuul Pro and The Authority Pro themes. But additional goals could be to drive traffic to your brick and mortar location. In that case you’d want a theme that supports a store locator and focuses on driving user’s to that goal. The key is to determine what goals you hope to achieve with your WordPress site and find a theme that helps you get there. As the web goes more and more mobile responsiveness across various screen sizes is a must. And there’s no better way to test it out than trying on your own mobile device(s). The WordPress theme scales down appropriately and doesn’t have any weird horizontal scrolling caused by elements being too wide. Images and graphics look clear on high resolution screens typical on most modern devices. Menus function properly on mobile devices. Typically there will be a 3-bar menu icon that opens a slide out menu or slide down menu. Fonts are clear and easy to read on small screen sizes. That’s just the tip of the iceberg you can discover when browsing a WordPress theme on your mobile device. As noted above one of the big issues with “do-it all” themes is performance. 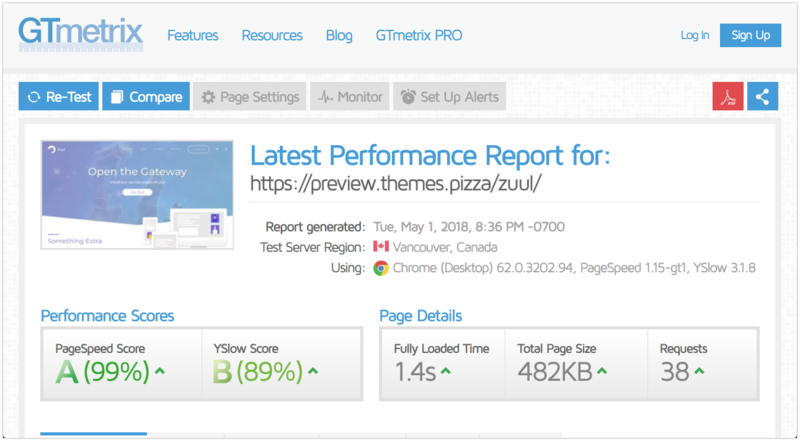 Luckily there are tools that make it easy to test theme performance. One of my go-tos is GTMetrix. Drop in the url of the demo site and it’ll run the site through several performance tests and give you grades on the other side. These aren’t a perfect indicator of theme performance as most demo sites will likely have server level speed optimizations. But you’ll want to check that the page isn’t loading excessively slow. Anything over 6 seconds for fully loaded is not a good indicator of the theme performance. You’ll also want to avoid themes that get into several megabytes on the total page size. Just a couple seconds of extra page load can significantly decrease conversions on your site. Search Engine Optimization is going to depend a lot on the content you create for your website. But there are still some best practices to look for when picking a WordPress theme. 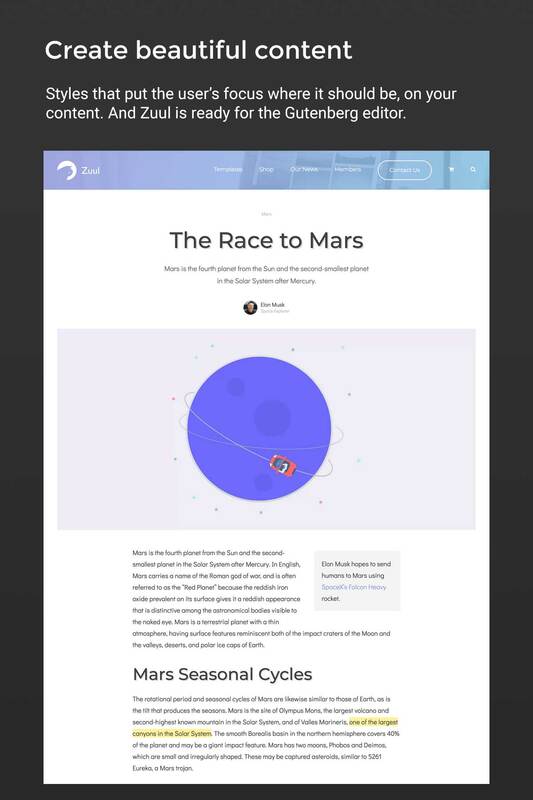 Some things you’ll want to check for are that the theme is only using one h1 element per page and that it’s the most important text on the page. Moz offers a really nice Chrome extension for checking some of the basic SEO settings. Fire it up on the demo site and you can get a good idea for how well the theme can be configured for SEO. This is a tough one to judge if you’re not a developer. But there are a few good indicators you can look for. Does the theme have a free version on WordPress.org? If so the theme passed through a pretty rigorous testing process to be accepted in the official WordPress theme repository. The developer likely has a good handle of the core coding standards. And it’s a good bet those translate to the premium theme. Is the theme offered under the GPL license? GPL is the standard WordPress license. Anything on the WordPress.org repository must be licensed under GPL. It’s pretty rare for a theme not to be licensed under the GPL. If it isn’t you might want to dig a little deeper into why. If a free version is available on WordPress.org you can check the support forums over there and see if the developer is responsive to user requests. If a premium theme developer isn’t supporting their free version it doesn’t necessarily mean they’re not supporting their premium option, but a developer putting in the leg work for their free projects is a good sign. Another good sign of an involved developer is if they’re supporting the WordPress community. It could be anything from blogging, speaking at WordPress conferences, or offering free plugins and themes. While not a perfect indicator of theme quality, if they’re involved with the community there’s a good chance they’re a good person to work with.